Striker Ched Evans had a debut to savour as his first ever Fleetwood Town goal ensured Joey Barton's unbeaten reign rolled on. The victory over ex-Town boss Micky Mellon's Tranmere side was well deserved for Fleetwood as Barton made it six wins in a row at Prenton Park. 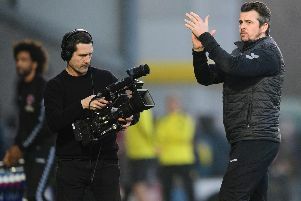 Barton opted for 4-3-3 once again and his side largely dominated possession and continued to implement the passing ethos Barton wants to see when the new League One term commences on August 4. The ex-Burnley man made five changes to the starting line-up that beat Zalaegerszegi TE 2-0 last time out with Gethin Jones, Eddie Clarke, Nathan Sheron, Craig Morgan and Kyle Dempsey all coming into the starting XI. Cian Bolger, Tommy Spurr and Conor McAleny moved to the bench while Ashley Nadesan, Lewis Baines and Harrison Holgate were not involved int he matchday squad. Tranmere came into the game on the back of a 2-1 defeat to last term's League One champions Wigan Athletic but it was Mellon's new League Two side Rovers who made the stronger start. After just two minutes, Tranmere forced a corner down the right and the resulting cross was only cleared as far as Zoumana Bakayogo - his shot comfortably saved by Alex Cairns. Fleetwood continued to be pressed back, a James Norwood shot in the seventh minute was saved by Cairns before being cleared by the Fleetwood defence and in the 14th minute, Fleetwood had their biggest warning sign from Tranmere’s early dominance. An Ollie Banks cross was headed across goal and met by Connor Jennings, the forward had the ball in the net but the goal was ruled out for offside. That scare proved to be the kick-start that Fleetwood needed and from then on they took complete control of the game. It was the hosts turn to be grateful to the offside flag moments later as Kyle Dempsey was played in behind the Tranmere back line. The 22-year-old's effort hit the post but it was a sign of what was to come as Town grew into the game. However, Fleetwood were improving, the midfield especially were over running Tranmere and when Harrison Biggins 22nd minute shot hit the post from the edge of the box, it was only a matter of time before Town made the breakthrough. The ever-threatening Dempsey, who has been pushed forward from midfield and utilised in a left attacking role by Barton, continued to show his attacking teeth. The Cumbrian cut inside onto his right foot before scuffing the ball towards Luke Pilling in the Tranmere goal. However, the young keeper couldn’t get set and the ball squirmed under his legs and into the net. Not a vintage strike for Dempsey's scrap book but still a sign of his new attacking intent, the midfielder already now equalling his two goal tally from last term before the new campaign begins against AFC Wimbledon. Shortly after, a Fleetwood corner was cleared to the edge of the box and Jason Holt unleashed a vicious shot - Pilling was up to the task this time but the chances continued to come. Tranmere managed a rare effort in the 35th minute through Jennings, Cairns saved comfortably but Town still finished the half stronger as Nathan Sheron, utilised once again in a new number four role, almost took advantage of some chaotic Tranmere defending before being denied by Pilling. Fleetwood emerged from half-time unchanged and had to resist another bright start from Tranmere, a few corners caused problems but were well dealt with by skipper Craig Morgan and Ashley Eastham. Among a host of second half changes, which inevitably disrupted the flow of the game, Evans was introduced for his debut a day after signing for the club on a season long loan deal from Sheffield United. And he didn’t have to wait too long for his first contribution. Shortly after Biggins nearly took advantage of a Steve McNulty slip for Tranmere, Evans fired in his first goal for the club. His fellow substitute Wes Burns teh architect for Tranmere's downfall in the 83rd minute. The Welshman won the ball on the right flank before whipping in an inticing cross and Evans did the rest. The forward netted 30 plus times for the Blades in League One in the 2011-12 term and showed the Cod Army a glimpse of that form, getting across the Tranmere defence and clinically finishing his first chance of the game to make it 2-0. Both sides seemed satisfied with their day’s work as the game fizzled out but it was another positive result for Barton who saw his new star striker net just 10 minutes after coming off the bench and his side pick up another clean sheet.